» Email Design Do We Change It Now For Mobile? Mobilize Mail > Email Design Do We Change It Now For Mobile? Email Design Do We Change It Now For Mobile? Posted on Monday, August 19th, 2013. In New Zealand email recipients are still using earlier versions of email clients like Outlook 2007 and browsers IE7 & 8. Recent developments in email design suggest we need to focus on mobile devices and how to get the eDM looking great on the smaller screens. 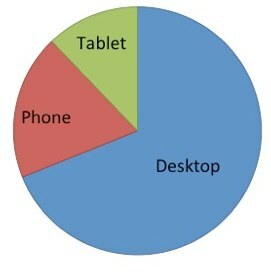 See earlier blog post on Mobile Device use in NZ. Mobilize Mail has been collating data on email client and device usage over the past three months and the results are suggesting mobile devices are increasing in use however more than two thirds of your recipients will more than likely still use a desktop or laptop computer and earlier versions of email clients and browsers and email design needs to cater to this large group of users. The desktop or laptop is currently most used device to open emails in New Zealand. The tablet is grabbing more of the mobile device market share and the expected trend is for ‘mobile devices’ to continue to grab overall market share and eventually be the device all email design must cater for first and foremost. New Zealand is lagging behind nations like America in mobile usage. America’s cheaper data plans would be accelerating the use of mobile for all things online. 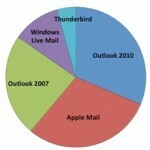 Desktop Email Clients – Who Uses What? 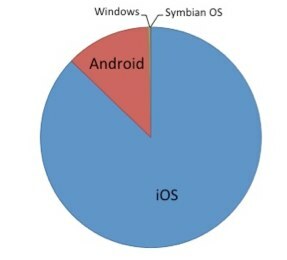 This result surprised us – on the desktop there are lots of Apple users in New Zealand. While Microsoft have the lions share split between 2007 and 2010 Apple are holding their own. Apple is loved by designers as it is very forgiving in how it renders email (eDM) HTML unlike Outlook. Outlook 2007 has it’s own unique set of rules. It’s high usage in New Zealand is dictating email design. Businesses and Government are slowing upgrading to Outlook 2010. Apple is the most used mobile device in New Zealand. iPhones and iPad tablets are the most used mobile devices for opening emails and this is very good news. Apple render emails perfectly so the high usage of Apple mobile devices is a relief to lots of businesses needing to ensure their eDMs render perfectly in the older versions of Outlook, Outlook.com, Gmail and mobile devices. Xtra (Telecom) is the clear winner and that’s not a necessarily good for business. It means there are lots of users who are using their Internet provider’s web email client rather than have their email delivered onto their desktop, or mobile – an email application with more functionality. Paradise (was part of Telstra Clear – now Vodafone) and you can see in the image that it has a very small market share – this is great for businesses. It is saying paradise’s users are getting their email delivered to either a desktop or mobile or web based email client (like gmail). In summary this data collated over a three month period is not absolute – it is indication of trends in New Zealand and we are reminded that email design is still dictated by the older versions of email clients that remain very popular with New Zealand businesses. We therefore have one eye on the future move to mobile devices and the other eye in the present.